RIF explores possible future ways of doing and organising research in order to inspire fresh thinking among research stakeholders about underlying potentials and looming risks in the present. Systematize knowledge of the emerging patterns, trends and drivers of change of ways of doing and organising research. Create an open debate between different communities contributing to knowledge dynamics from their respective perspectives and explore room for joint action. 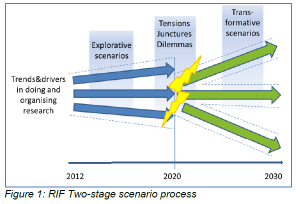 The core element of the RIF methodology is a two stage scenario process as shown in figure 1. In the first workshop participants developed “explorative scenarios” with a mid-term time horizon by extrapolating today’s trends and drivers (c.f. RIF 2012). Out of these explorative scenarios they identified a set of tensions, junctures and dilemmas that could be emerging in the mid-term if current dynamics continue (c.f. figure 2). In the second transformative scenario workshop the RIF team and a few selected external participants with a background in the most relevant issues brought forward by the preceding workshop developed the “nuclei of change” from the previous workshop into draft transformative scenarios within plenary and group brainstorming sessions. On each world café table the team had placed a characteristic image and short descriptive paragraph for one transformative scenario draft. In group sessions of ca. half an hour participants commented on the drafts and enriched the scenarios. Several rounds were carried out so each participant was able to comment on at least two scenarios. One table had been reserved in case participants proposed additional scenarios, which was indeed the case when an entirely new wild card scenario was proposed by one of the participants. In the second session participants relating to the four stakeholder groups science, policy, civil society and industry worked in separate groups. In a first step they defined their core strategic objectives with respect to research. Secondly, they assessed opportunities and threats for these targets for all six scenarios. The RIF project has now arrived at the midterm of its duration. The next two workpackages will be dedicated to stakeholder debate on policy implications and strategic options emerging from the scenarios. For this purpose several participatory foresight workshops will be held. Some of these strategic conversations will be crosscutting while others will address specific stakeholder groups that are facing particularly relevant strategic issues according to the scenario analysis. The majority of the participants came from different European countries representing some organisations from regional, national and European level but also from other continents and international organisations. RIF achieved a good balance between female and male participants. The RIF project is still on-going. 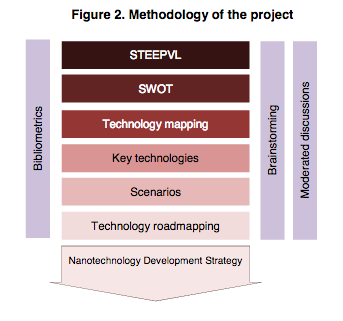 Currently, the scenario report containing the explorative and transformative scenarios emerging from the stakeholder process is being finalised. The insights generated by the stocktaking and draft scenario building are available and summarised below. European research is coordinated by “Open Research Platforms (ORP)” where different types of globally connected actors align their funding activities. Each ORP runs an open knowledge sharing WIKI platform where researchers integrate their findings. The new gate-keepers of scientific quality are science & society social networks. University performance is judged by their contribution to the ORPs success. European research and innovation is strictly organized around Knowledge and Innovation Communities (KICs) that develop solutions for key societal challenges through large scale socio-technical research and experimentation aligning diverse actors and knowledge types. Large shares of public budgets are used to finance the KICs in a coordinated manner. This happens in a period of reduced economic growth in Europe, where higher priority is given to other dimensions of quality of life. The research landscape is coordinated through a fully tailored system of functions fulfilled by highly specialised actors that share revenues according to market rules. At the top of the pyramid, Research Assembling Organisations (RAOs) integrate the contributions of second and third tier research service providers into systemic solutions. A few actors define the rules of interaction and control access to research results and resources. Science is viewed as one of the key enablers for winning the global competition race. A dedicated group of scientists, also known as “slow science community”, is orienting re-search towards societal and policy needs and placing high emphasis on work-life balance and on making the results of their research work effective in practice. The community is locally rooted, globally connected and funded by bottom-up crowd-funding from diverse sources. Driven by business pressure, the Europe’s emphasis is on innovation-oriented research with a focus on improving mid-term global competitiveness. Independent basic research has almost vanished and struggles for funding from public sources. To reach the ambitious requirements of wellbeing and happiness until 2030, by 2020 a fully distributed research system based on virtual open science communities, micro-funding and real science markets emerges. Virtual communities grow stronger due to shared methods and processes, affordable tools and applications, as well as to ambitious young talents working and striving for societal reputation. Social science entrepreneurs are climbing up the ladder of success and foster bottom‑up innovation. 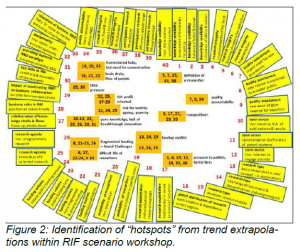 These scenario drafts are now being consolidated on the basis of the input from the third workshop which is documented in RIF 2012. The full scenario report will be available soon after. Strategic options for society and policy (WP4). The scenario report will present a consolidated version of the scenarios based on the inputs from the third workshop. Amanatidou, E., Cox, D., Saritas, O. 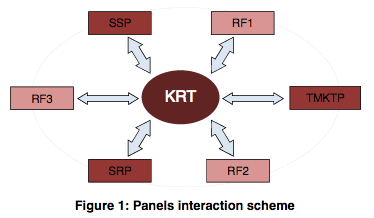 (2012): RIF Deliverable 4.1: Stakeholders in the STI System. Mitchell, R. K., Agle, B. R. and Wood, D. J. (1997), ‘Toward a Theory of Stakeholder Identification and Salience: Defining the Principle of Who and What Really Counts’, The Academy of Management Review, 22 (4), 853–886. Schaper-Rinkel, P., Weber, M., Wasserbacher, D., van Oost, E., Ordonez-Matamores, G., Krooi, M., Hölsgens, R. Nieminen, M., Peltonen, A. 2012: RIF Deliverable 1.1 Stocktaking Report. The renewed Lisbon strategy stresses the need for Europe to place more emphasis on anticipating skill needs. Globalisation, technological change and demographic developments (including ageing and migration) pose huge challenges in that respect, comprising both risks and opportunities. At the same time, a lack of information on future skill needs has been a long-standing concern in Europe. With specific targets set in the Lisbon strategy, the need for regular forward-looking assessments has gained momentum. Subsequently, this resulted in the recent New Skills for New Jobs initiative by the European Commission, and related European projects aimed at identifying future job and skills needs using quantitative modelling approaches. While having advantages of robustness, stakeholders as well as the European Commission identified a clear need for complementary, more qualitative forward-looking analysis. Consequently, the European Commission (DG EMPL) earlier this year commissioned a series of 17 future-oriented sector studies (Horizon 2020) on innovation, skills and jobs following a qualitative methodology. The final results of these studies will become available in spring 2009, and will be followed by a number of other initiatives over the year to come and beyond. The objective of ForeSec is to tie together the multiple threads of existing work on the future of European security in an attempt to provide a more coherent guidance, orientation and structure to all future security-related research activities. It aims at enhancing the common understanding of the complex global and societal nature of European security in order to pre-empt novel threats and capture technological opportunities. The project takes a participatory approach in an attempt to facilitate the emergence of a coherent and ho-listic approach to current and future threats and challenges to European security. ForeSec builds a pan-European network around the European security foresight processes and helps foster a societal debate on European security and security research. As this brief is published, ForeSec still has a few months of project work lying ahead. Accordingly, all results presented here are merely intermediate. The project was an activity within the framework contract between the European Parliament and ETAG, the European Technology Assessment Group, to carry out TA studies on behalf of the Parliament’s STOA Panel in view of the growing importance of a European science and technology policy. The purpose of this particular project was to identify current and expected technological and market developments in the field of ICT with an impact on the media industry and to indicate regulatory challenges and requirements stemming from the anticipated changes. The main target group are the Members of the European Parliament; the wider addressee is the interested public. The brief provides a short overview of a project in which Deutsche Bank Research has combined its own foresight expertise with inputs from the bank’s business strategists and external experts in order to develop scenarios for the future development of the German economy and society against the backdrop of intensifying structural change. Deutsche Bank and its clients require knowledge about the future for their investment decisions. Deutsche Bank Research provides this “corporate foresight”. A multidisciplinary team develops and applies a wide range of methods to identify longterm macro trends. These foresight results, which are achieved on the basis of structured, process-based, quantitative and qualitative analyses, are fed into discussions with strategic management and clients as well as into public debate on broader economic, societal and political issues. The next two decades will be crucial for determining the path Germany will take over the long-term. Will German society be able to cope with the demographic pressures bearing down on the economy and the state’s finances? Will Germany succeed in redefining its role in the rapidly changing global economy and world order? 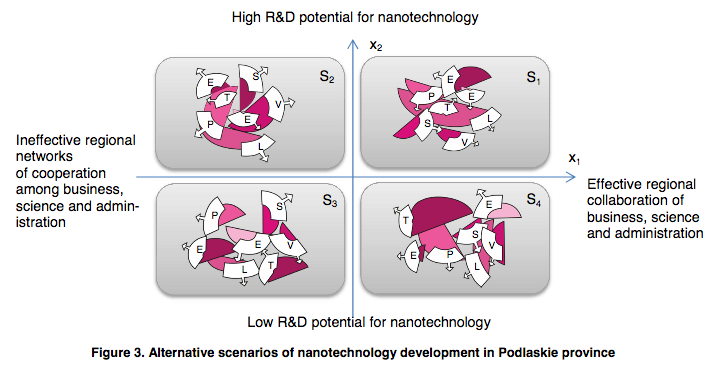 Will Germany be a leader or a laggard on the road to a knowledge economy? Our first step was to sketch four alternative scenarios outlining how the German economy and society may have developed by the year 2020 (“Expedition Deutschland”, “Wild West”, “Drawbridge Up” and “Skatrunde (Playing Cards) with the Neighbours”). In the second step, we used broadly-based trend analysis to examine which of these four future scenarios is the most plausible. the capital market now takes interest not only in a company’s traditional balance sheet ratios but also its research efficiency, education and training budget, and cooperation ratings. The young and seasoned minds that house this intellectual capital benefit from efficient learning markets in 2020. Private operators of learning services prosper. Also, the public universities and other educational facilities have become more efficient following a wave of consolidation. Furthermore, they are more strongly involved in the market for modular education and training. Government reduces its intervention and there is more coregulation. Co-regulation closely integrates citizens and companies. On the one hand, legitimation problems have motivated the state and still tight fiscal constraints have compelled it to cede part of its mandate to others. On the other, the regulatory issues have become increasingly complex. More than ever before, the state needs to tap the knowledge of citizens and companies to be able to set suitable framework conditions. Regulatory regimes that emerge in this way are more intelligently geared to the needs of business and society. They are more transparent for people and companies alike and ease the struggle into new markets. In general though the state’s abandonment of parts of its mandate has resulted in social transfers now coming with strings attached. In addition, more and more social services (e.g. long-term care) are organised on a private basis. Germany has become a “stakeholder society” based on reciprocal action. A new middle class emerges in German society by 2020, but the lower periphery falls behind. The middle class celebrates its comeback. The new opportunities for upward social mobility and the higher risk of social decline, both being the consequence of increasingly global and volatile value creation, have clearly shown the middle class the value of knowledge. Many Germans with a mid-range income therefore invest heavily in education – and thus gain qualifications for the demanding, but at the same time well-paying jobs in the project economy. Well-educated older people also benefit as they are intelligently integrated in the working world in 2020. By contrast, low earners have only limited access to the new learning markets, and young and old alike often have to fear for their livelihoods. International competition has an even more incisive impact on this group than on others. Many low earners are compelled to organise themselves in self-help networks and many have lost their faith in politicians. These elements, however, are interrelated with three other aspects of structural change which are already well under way and which, in our view, have rather trend-like characteristics. ― Globalisation leads to new centres of gravity in the international value creation chain. ― Energy supply shows a broader mix and decentralised production. ― Digitisation enables networked goods flows in the new Internet. Given the structural changes outlined here on the way to “Expedition Deutschland”, we expect Germany’s gross domestic product to grow at an average rate of 1.5% per year up to 2020. From a 2007 perspective, these changes will pave the way to extraordinary opportunities for business, society and politics, but also harbour substantial risks. Some key fields of action for business include, for instance, a structured analysis of collaboration options, a more systematic assessment of intangible investments, broader acceptance of new forms of education and training, and an increase in life-long learning activities. The guiding question for our scenario analysis is how will structural change have affected the German economy by the year 2020? In order to answer this question, we applied a methodology based on a simple scenario approach. Normally, one identifies the two key drivers to build a “scenario matrix”. Each field in the scenario matrix represents a different combination of attributes (high/high, high/low etc.) of these two drivers, and one scenario is developed from each of their respective interactions (see Figure 1, for an overview of the different elements of our scenario analysis see box on page 4). In addition to these drivers, whose future development is uncertain, there are a number of trend-like drivers – whose future development is comparatively predictable (in the following they are referred to for short as “trends”) – which impact on all four scenarios. These trends show similar developments in all four scenarios. But our scenario question is multi-faceted; the number of relevant drivers and trends is high. To cope with this complexity without losing too much information, we have advanced the above approach: we have aggregated drivers that are thematically related and whose development is correlated into “dynamics” (the trends, too, are aggregated into “trend-like dynamics”, see the figure Deriving scenarios by reducing complexity). 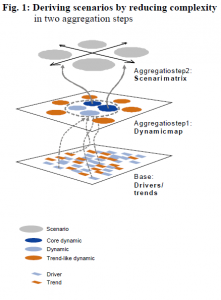 Instead of taking individual drivers, we build the scenario matrix with the two key dynamics. Further information and a discussion of the merits and drawbacks of this approach can be found at www.expeditiondeutschland.de/en. Nonetheless, through interaction with the other drivers, the trends can develop or impact slightly differently or at a different pace in each scenario. In the scenario method these drivers are often referred to as “determinants” and the trends as “premises“. Classic scenario analysis examines alternative future developments – but without highlighting any one of the depicted scenarios as the most probable scenario. For good reason since the scenario method does not in itself deliver any (or sufficient) indications as to which picture of the future is the most probable. We are deliberately breaking with tradition of future research here: we identified a number of trends or trend-like dynamics that have an exceptionally strong influence and whose general future development can be predicted particularly reliably. They are driving Germany in the direction of one of our four scenarios and therefore make it particularly plausible. We refer to this scenario as the focus scenario and call it “Expedition Deutschland“. These trends relate to developments in a broad spectrum of fields in business, society and politics as well as in science and technology. They partly reinforce each other, a factor that has further encouraged us to focus on this one scenario. We have systematically analysed the interactions between many of these trends in the earlier project “Global Growth Centres 2020” (see Bergheim, Stefan (2005), loc. cit.). Our focus scenario is not a forecast. In 2020, Germany will look only in parts like we have described in our scenario. Rather, there will be a mix of elements of all four (and maybe other possible) scenarios. — “Driver”. Important factor of influence on future structural change in Germany whose future development is difficult to predict. — “Trend” (trend-like driver). Important factor of influence on future structural change in Germany whose future development is reliably predictable. — “Dynamic”. Aggregation of (mostly non-trend-like) drivers which are thematically related and whose development is correlated. The future development of a dynamic as a whole (without drawing on additional information) is difficult to predict. — “Trend-like dynamic”. Aggregation of (mostly trend-like) drivers that are thematically related and whose development is correlated. The future development of a trend dynamic as a whole is reliably predictable. given combination of developments of the dynamics considered (and the expected developments of the trend-like dynamics). “Consistent“ means here that the interaction of the various elements has been taken into account. — “Focus scenario”. The one of our four alternative scenarios for Germany in the year 2020 which we consider to be the most plausible owing to the future impact of some of the above “trends“ and “trend dynamics“. Our message is that, as far as we can judge today, it appears plausible that Germany is more likely to resemble our focus scenario than the other pictures of the future developed here. We have developed posters to sum up the content and convey an intuitive image of the key messages of our four scenarios. They depict the behaviour of businesses and citizens (as persons), the market playing field (as environment/terrain) and the regulatory framework (as sky/weather) in 2020. 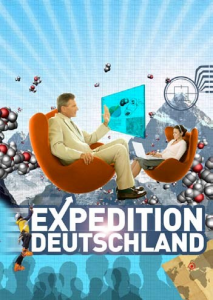 To give an example, here we show the poster for the “Expedition Deutschland” scenario discussed above. Manufacturing in Europe is facing challenges that may impact on its performance in the near future: the emergence of international competitors, new technologies allowing the emergence of new business models, increased off-shore and relocated activities. The aim of this study was to provide policy-makers with a long-term vision of European manufacturing, its characteristics, its place in the EU economy, in the world and the main challenges it will be facing. Its purpose was to identify, on the basis of current demographic, environmental, technological, economic and social trends, and possible scenarios, the likely bottlenecks, unsustainable trends and major challenges that European manufacturing will have to face over the coming 30 years. From this, implications for various microeconomic policies, notably for industrial policy, were explored, contributing to the mid-term review of industrial policy in 2007 by the European Commission’s Directorate-General for Enterprise and Industry. Manufacturing in Europe is affected by a changing world. In 2004, ten countries joined the EU followed by Bulgaria and Rumania in 2007. Most of the new member states have a different economic structure and other comparative advantages than the ‘old’ EU-15, in particular in labour-intensive industries. This is also the case for the candidate countries from the Balkans and Turkey. Enlargement hence not only offers opportunities in terms of a larger domestic EU market, but also in terms of specialisation and – associated – economies of scale and scope. two long-term scenario-based views on the future of European manufacturing and (2) to explore the scope for EU policies to positively address and influence the future. The scenarios in this study have been developed in three consecutive stages, consisting of (i) a survey of existing futures studies, (ii) the drafting of qualitative scenarios, and (iii) a quantification of the scenarios using WorldScan, a dynamically applied general equilibrium model for the world economy. This approach was designed as a hybrid combining the traditional foresight studies with more quantitative oriented economic-scenario studies. results that are challenged by approaches focusing on quantitative analyses. This study therefore aimed to bridge the two communities by employing methods used in each of them. As such, the results of the study can also be seen as an experiment on how to conduct such studies in the future, combining methods from different communities. As outlined above the study consisted of three distinct parts: a literature survey, the development of qualitative scenarios and the quantification of the scenarios using a modelling approach. The survey of futures studies served two goals: (1) to help identify the relevant main drivers and trends that form our current perspective and knowledge that can be seen as key to the future of manufacturing in Europe and (2) to explore what other expert groups and think tanks regard as possible manufacturing futures. The timeframe considered in the literature surveyed ranged from 2015 to 2050. 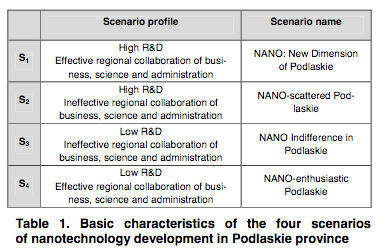 During the course of stage one, 101 foresight reports, scenario studies, academic publications and policy documents were surveyed along five clusters: international, technological, social and environmental trends and drivers as well as new business models. The studies surveyed covered European studies, global studies, North-American studies and South-East Asian studies in order of importance. FutMan, ManVis and Manufuture – three major EU-wide foresight projects conducted over the past five years – formed the backbone of the survey. The results of these foresight studies were supplemented by other materials ranging from theme or aspect futures studies (e.g. expected income developments; impacts of climate change) to similar foresight studies carried out in other countries, such as the U.S. (e.g. IMTI, 1998; SRI), Japan (Nistep, 2005) and China (NRCSTD, 2005 – for further references see full background report [Zee & Brandes, 2007]). a European response of retreat. Politically unstable regions, threats of international terrorism, absence of binding action at global scale to tackle the negative consequences of climate change and the inevitable depletion of fossil fuels, and – related – a lack of real breakthroughs in alternative energy production and promising new technologies (nanotechnology and to a lesser extent biotechnology), give people the feeling of standstill and uneasiness. This in turn translates into a downturn in consumer and producer confidence and more inward-looking and risk-averse behaviour. Trust is something that may be found close by, but certainly not far from home. Rising energy prices and strong increases in monitoring and control of international movements of persons, goods and services result in a cost explosion in international transport and trade, which significantly alters the turn-of-the-century trend towards a further integrated world economy. Adventuring the World This scenario depicts a European manufacturing sector that is faced with an overall business and political climate of international cooperation, openness, but also strong competition. European self-confidence strengthens as the political and ideological emptiness that characterised the turn-of-the-century era has been replaced with new inspiring notions of Europe’s role in the world. This includes Europe assuming the position of a front-runner in solving problems of global warming, energy use and ageing as well as major breakthroughs in European social and cultural integration. Renewed decisiveness has triggered momentum at the global level and geo-political instability and threats of international terrorism are gradually disappearing. 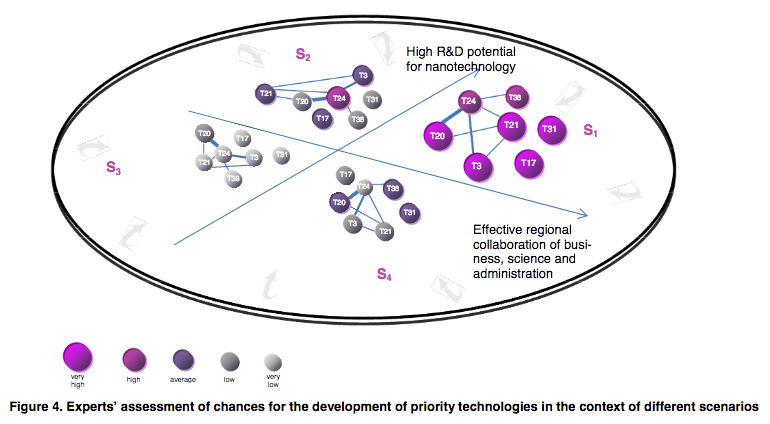 Considerable progress is made in alternative energy production and promising new technologies (nanotechnologies and biotechnology) have taken hold. A general upswing in consumer and producer confidence combines with new openness, and outward-looking and adventurous entrepreneurial behaviour. Trust relationships thrive. Rising energy prices stimulate new and more cost efficient energy-saving ways of transport of persons and products. Adequate road pricing and energy taxation increasingly supplant traditional labour taxes, making mobility and energy consumption better manageable and curbing harmful consequences. In the third step, the scenarios were quantified using an applied general equilibrium model for three main purposes: (1) the model ensured that the scenarios were consistent, since economic variables allow to describe and relate constraints and the current knowledge about interactions in the economy in a consistent form; (2) the quantification gave a feeling for the relative importance of various developments for the future well-being of society; (3) the model also offered the possibility of assessing the impact of framework policies and their relative importance. However, large parts of the scenarios could not be quantified, as the general trends observed are expected to impact variables over too long time horizons for workable quantitative assumptions. The complex feedback loops furthermore make it only realistic to illustrate the scenario trends related to economic growth and economic integration, which are at the heart of the WorldScan model. (For details on the quantification of the scenarios and their expected impact on manufacturing please see the ‘final report’). The quantification of scenarios sketched the macroeconomic developments, showing the possible impact of globalisation, technological change, ageing and structural change towards a service economy on economic growth and trade. Europe is expected to become less important as a place for manufacturing production in both scenarios as manufacturing shifts to Asia. The question whether these trends could be affected by policies was assessed in the third step. Rather than thinking about targeting and subsidizing specific industries, framework policies that could affect the environment where industrial production takes place in Europe were modelled for potential impact on the scenarios. The framework policies analysed were: (1) upgrading skills, (2) more effective regulation and less administrative burdens for firms, (3) R&D and innovation policies, (4) a strong competitive single market, (5) environmental policies, (6) supporting energy policies and (7) global trade policy. The macro-economic outcomes for the EU as a whole in 2025 for both scenarios were analysed under the different framework policies. The differences between the two scenarios are minor. In Adventuring the World, GDP increases slightly more than in Cosy at Home, mainly because of the large impact of R&D and internal market policies. Exports increase faster in Cosy at Home, largely due to a composition effect of a higher share of total exports destined for other European countries. An increase in intra-EU exports due to new single market policies thus has a larger effect on total exports. R&D and innovation policies have the largest impact representing about 40% of the total GDP effect based on the lower bound returns in the literature. The reduction in administrative burden adds about 1.5% to GDP, internal market policies about 2% and skills even less. However, over time, when the whole labour force has been educated, the effects of upgrading skills will be larger. From Gelauff and Lejour (2006) we know that GDP effects will be three times as high in 2040 compared to 2025. However, compared to other framework policies, the economic effects even in 2040 will be unsubstantial. The analysis has shown that the share of manufacturing in employment and value added has decreased in Europe for decades reflecting structural changes in the global economy. However, manufacturing will remain important for trade and productivity increases, outpacing by far the service sector. innovation policies and strengthening the internal market, on the other hand, have the strongest and most positive impact on manufacturing. They are also the most ambitious in terms of policy formulation and implementation, and potentially very effective in supporting manufacturing because of their R&D intensity and open-to-trade nature. In the coming decades, Europe’s decreasing share in global manufacturing production and trade will flatten. The EU framework policies support this slowing of the relative decline of manufacturing activities in Europe, which may even come to a near standstill in sectors such as chemicals, rubber and plastics, and combined machinery and equipment. The key results of the study were published as part of Chapter 5 of the European Competitiveness Report 2007. More details and the full scenarios are published in the background reports and final report and can be accessed via the website of the European Commission and the CPB the Netherlands. Globalisation has become a keyword of the 21st century. Who are the winners and who are the losers in a globalised world? The term globalisation triggers extremely contradictory emotions among the people of Europe. One third of Europeans (33%) regard themselves as winners of this development and see globalisation as a kind of liberation from overly constrictive and outdated boundaries. In contrast, one in five citizens feels to have lost out in this process (21%). Europeans only agree on one issue: the process of globalisation can neither be halted nor reversed. These are the results of the first European representative study that asked 11,000 citizens aged 14 and above in Belgium, Finland, France, Germany, Great Britain, Hungary, Italy, Russia and Switzerland about their hopes and fears for the future. The study was part of a research project by the Stiftung für Zukunftsfragen (Foundation for Research on the Future) of British American Tobacco. between the winners and losers. Citizens doubt whether this distribution is socially just and fair. regions were included in the sample. The European study was a research project of the German BAT Stiftung für Zukunftsfragen. An external market research institute GfK (Gesellschaft für Konsumforschung) and its partners in the various countries conducted the study. What is the Stiftung für Zukunftsfragen? The BAT Stiftung für Zukunftsfragen, a German foundation for examining societal expectations, promoting the scientific debate on issues determining our future and furthering approaches to a sustainable resolution of social issues of the future. Futurologists at this foundation have been examining societal expectations since 1979. The foundation acts as an independent interface between science, economics, media and politics. For many important opinion leaders, the foundation’s future research has provided support for political and social decision-making processes for decades. According to the study, the most enduring and sustainable future safeguard for all Europeans is, without a doubt, quality of life. First and foremost, quality of life means one’s health (95%), family (90%) and friends (88%) – partnership (78%), nature, education and work (76% each) are rated slightly lower. Spending money and having leisure time (65% each) are regarded as important by two thirds of those questioned. Religion is mentioned by only one third of the people asked (30%) as a factor significant to personal well-being with even sports ranking higher (39%). Italians love culture and are proud of their faith. In Italy, culture (76%) and religion (48%) are of above-average importance compared to the other countries; in contrast leisure time (51%) and spending money (53%) play a subordinate role. For Russians, the family, consumption and money are particularly important. Russia is the only country where the family (90%) ranks first; the importance of spending money (74%) is also significantly above the average value. On the other hand, friendships (68%), education (62%) and nature (48%) are rated as least relevant compared to other countries. The British attach importance to lifelong learning. Amongst all of those questioned, the citizens of the United Kingdom state education most frequently (86%) as a guarantee for the future.The Finns are nature lovers. In addition to nature (91%), leisure time (85%) and sports (71%), friendships (94%) and partnerships (84%) are mentioned as important for quality of life. For the Germans, health (98%) is integral to quality of life. This nation, however, attaches the least importance to family, culture and religion of all the countries surveyed. The Hungarians are seeking for consumption. In Hungary, spending money (84%) plays the biggest role compared to the other countries. The Swiss count on partnerships. On average, the Swiss mentioned the lowest number of factors as important for future quality of life – this may be because many of the conditions are already in place today. The significance of partnerships is above average (83%), whilst the relevance of spending money was the lowest of all the countries. The French want a bit of everything. The French mention the greatest number of factors of all those questioned. Family (95%) and culture (75%) in particular are important for quality of life. Belgians set particular store by spending money (76%). Furthermore, in no other country do more respondents mention the family as significant (95%). Europeans do not necessarily wish to improve their standard of living but rather their quality of life. Answers to the question “What are we living for?” are called for. There was agreement amongst those questioned that one’s own health is “the” prerequisite for quality of life. This is followed by family and friends in almost all countries. Alongside health, social areas are coming to the fore. On the other hand, the importance of aspects which were formerly central to quality of life, such as work, consumption and leisure time, is declining. Crime is Europe’s unsolved problem. Two thirds (66%) of those questioned from Helsinki to Rome, Moscow to Zurich and Berlin to London state that fear for their own safety was – by far – their greatest worry for the future. The majority of concerns are focused on interpersonal dealings associated with a feared loss of prosperity. Aside from fear of crime, increasing levels of aggressiveness (51%), decreasing honesty (41%), selfishness (38%) and intolerance (37%) are all causes for concern. The consequences could be loneliness (29%) or social exclusion (27%), which almost inevitably result in social conflict. The entire network that unites, keeps together and protects society is in question. Crime is mentioned most frequently in Switzerland (80%) and least frequently in France (49%). Intolerance, on the other hand, is rated highest in France (58%) and lowest in Russia (15%). Xenophobia is also not a major issue in Russia (8%), whilst for the Swiss this is particularly relevant (44%). Social conflict is mentioned in Germany (42%) twice as often as in Italy (21%). Envy is a far more significant issue in Belgium (39%) than in the United Kingdom (15%). Lack of respect for children is hardly of relevance in Hungary (15%), whilst in Germany this is a major issue (40%). Indifference as a concern for the future is mentioned by a majority of Finns (53%) compared to only a minority of the British (18%). Social cohesion as a society’s central resource is threatened. It is being replaced by an aggregation of individuals whose behaviour is determined by short-term cost-benefit calculations and guided by the question: “How can I benefit?” Every single society requires a minimum of solidarity and feeling of community. This, however, requires that people are united and feel responsible for one another. Just as the desire for a sense of community, solidarity and security grows, it becomes increasingly difficult to satisfy these wishes. This presents a challenge to every single one of us. Politics is only in a position to provide the framework, whereas people are responsible for implementation. Europeans are just as aware of their fears as they are of potential solutions. There are signs of a positive change in values: the focus is shifting towards pro-society values, aimed at ensuring harmonious cohabitation. These values include friendship (65%), social justice (60%) and reliability (59%). There is also agreement amongst the majority of people asked about the following values: love (58%), helpfulness (55%), freedom (53%) and friendliness (50%). In response to the question which values are particularly important to the person questioned, the following rate slightly lower: loyalty (48%), conscientiousness and social responsibility (46% each). European countries has shown that there are signs of a renaissance of faith in the future. The citizens of Europe are becoming increasingly confident. The age of egoism is slowly coming to an end. And reliability can once again begin to take hold where arbitrariness once flourished. The results of the study will be interpreted in detail and published in March as a hardcopy (about 80 pages, German and English). This publication will be sent to members of the German and the European parliament who deal with issues affecting the future of Europe. Press releases will be sent out in all nine participating countries. The study is a first approach at addressing one of the main projects of the foundation in 2008 called The Future of Europe. Members of the EFMN Network who are interested in the publication can contact the foundation by email and we will send a copy of the study (a PDF file) in the 2nd half of March 2008.